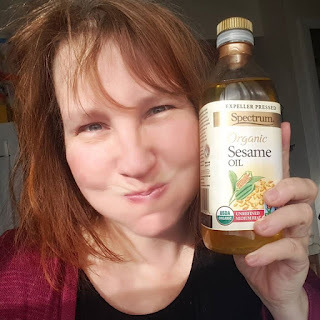 So, yesterday was my first official day of oil pulling with sesame oil. I've tried coconut oil in the past, but never long enough to have any real results. This time, I am dedicated to seeing what kind of changes I can see in my teeth over the next few months. So, I'll be swishing with this oil daily and posting my results randomly. I'd like to say weekly, but well, I know myself better than that. I want to be scheduled and organized, but I am just not good with schedules and weekly-ness. It's going to be hard enough for me to do daily oil thing. So, I'm just gonna be real and speak the truth. I'll post my results on random days when my house is quiet enough for me to focus and I feel confident + brave enough to share. Why would I want to fill my mouth with oil and swish it around for 20 minutes a day, every day, for 90 days? My teeth feel surprisingly smooth and clean after swishing with this oil. I definitely appreciate the texture of the sesame oil, over the solid consistency of coconut oil. I did notice a bit of a sore throat starting as I swished, so I tried to keep the oil more towards the front of my mouth. While it would probably mean there is bacteria in my throat that needs to be cleaned up, I don't want to have a sore throat all day, so it will have to wait. No noticeable changes yet, but I didn't imagine that 2 days would be enough to make a difference.